Just to mention a few design highlights. The design of the Xeon server solution is such that the system can be passivly conductive cooled. This fact the operation of the system even in the extended temperature range. The conductive cooling concept can be adjusted to the actual application and installation place. Therefore it is universal, on request it can be even equipped with a failure protected ventilation array. The MXCS is modular and therefore extremely flexible and can be used in any rugged application. It can be used with an enclosure as shown for wall or desktop mounting, as 19" rack with 1.5 HE or 2 HE, depending on the internal expansions and selected cooling mechanism. - Expansion capabilities for GPGPU on MXM, PCIe (eg. RAID, high end graphics or XMC modules. - Optional TPM module, with Intel chip or FPGA. The MXCS is the perfect solution for an unlimited range of application like C4ISR, EW, imaging processing, surveillance, virtual machines, data center processing or any application that requires most processing power in a small space without the need of a fan and highest reliability. The MXCS is 100% designed and produced by MPL AG in Switzerland. The MXCS is designed to meet most standards like CE, UL, MIL-STD-810G, MIL-STD-461F, MIL-STD-704F, MIL-STD-1275D, CE, EN50155 or IEC 60945. 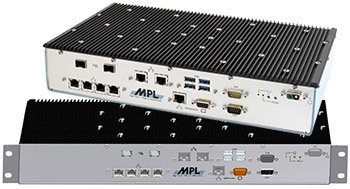 The MXCS conforms to standards like all other proven Embedded Computer and Networking products from MPL AG, supplied for the past 32 years. For more specific information, please contact MPL AG.